The Brian Tumour Data Dashboard is an interactive online chart which shows the latest data released on brain tumours by the National Cancer Registration and Analysis Service (NCRAS). Health Data Insight developed the dasboard in partnership with the brainstrust. The dashboard visually displays data released publicly by the Get Data Out programme from NCRAS. 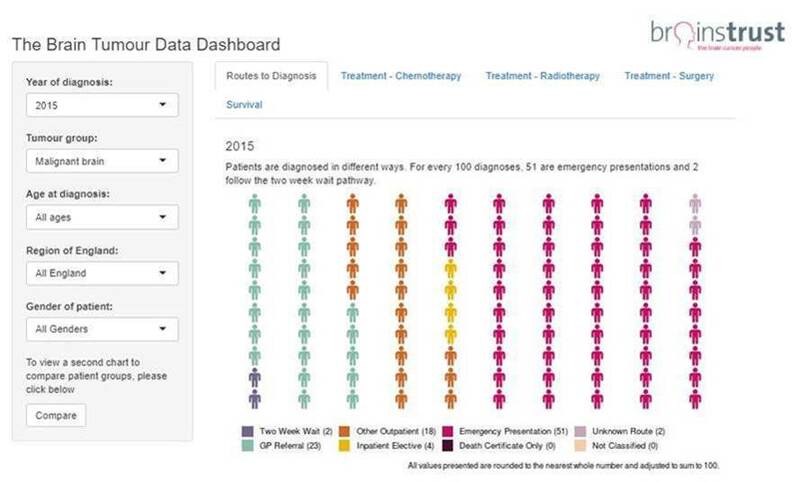 The dashboard shows data about incidence rates, the routes to diagnosis, the percentage of patients receiving chemotherapy, radiotherapy and surgery, as well as the survival rates for brain tumour patients diagnosed from 2013. Brain tumour patients have been divided into groups based on age and tumour morphology to provide additional detail.